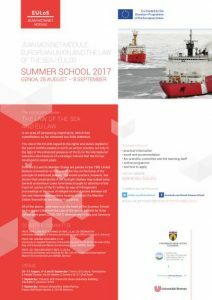 A number of general and more specific issues, touching upon several topical subjects, will be dealt with during the summer school. 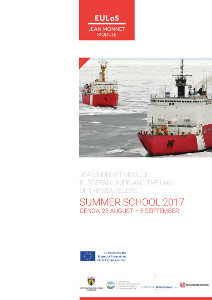 International and EU Law of the Sea: Coherence or Conflict? Each of the above four modules will be covered during two days of lectures, after which a practical activity (group work) will be held to test the knowledge and the skills acquired. [ NEW ! ] A fifth subject of interest in the context of this year’s offering will be blue growth, which will be approched in tho half-day sessions of Friday 1 and Friday 8 September. 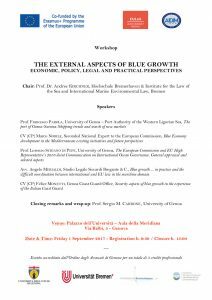 The morning of Friday 1 will be devoted to a workshop entitled “The External Aspects of Blue Growth: Economic, Policy, Legal and Practial Perspectives” to be held at the main building of the University of Genoa. On the morning of Friday 8 lectures will be offered on seabed mining, the regime of genetic resources at sea and biodiversity protection in areas beyond national jurisdiction. Please note that the list of subjects and speakers is subject to amendments until confirmed as final.